Following a year of exceptionally low volatility in 2017, a rise in turbulence during Q1 brought the first correction in two years as the bull market reached its 9th anniversary. Global diversification with both stocks and bonds continued to benefit investors as emerging markets remained among the top performers during Q1. Defensive asset classes played their intended role in helping to offset stock declines as gold and international bonds delivered positive returns for the quarter. Fundamental Indexing and market cap indexing split performance leadership during Q1, illustrating why Schwab Intelligent Portfolios includes both forms of indexing for diversification. During a challenging quarter for financial markets, broad diversification helped moderate portfolio declines across the risk spectrum. How did financial markets do in Q1 2018? The first quarter of 2018 brought the 9th anniversary of the bull market—which dated back to March 2009—as well as the first market correction in two years. Following a year of exceptionally low volatility in 2017, the S&P 500® Index of U.S. large cap stocks jumped to new highs in January and then quickly reversed course, tumbling more than 10% in early February. The S&P 500 continued to swing higher and lower throughout the rest of Q1, ending down 0.8% in its first negative quarter since Q3 of 2015. Defensive asset classes played their intended role, moderating overall portfolio declines amid the turbulence as gold and international bonds delivered positive returns during the quarter. Global diversification continued to benefit investors as emerging markets stocks and bonds remained among the top performers. Additionally, U.S. small cap stocks held up better than large cap multinational companies, due to the greater domestic focus of smaller companies, amid concerns of the escalating friction over global trade policy. As we had cautioned clients for several quarters, volatility was expected to increase in 2018 in the wake of the exceptionally low volatility of 2017. While market corrections can cause some anxiety, it's important to remember that they are a normal part of ongoing market advances. Although the U.S. stock market posts positive returns in most years, it typically sees a significant pullback at some point during the year. During these rocky periods, it's important to stay focused on your longer-term goals rather than overreact to short-term volatility. Investing in a diversified portfolio based on your goals and risk tolerance can help you navigate these rough patches. Source: Morningstar Direct, as of March 31, 2018. Performance figures shown are total returns for each asset class during the designated period. Indexes used are emerging markets debt, Bloomberg Barclays Emerging Markets Local Currency Government Bond Index; emerging markets stocks, MSCI Emerging Markets Index; international bonds, Bloomberg Barclays Global Aggregate ex-USD (Hedged) Bond Index; gold and other precious metals, S&P GSCI Precious Metals Index; international small cap stocks, MSCI EAFE small cap Index; U.S. small cap stocks, Russell 2000® Index; U.S. large cap stocks, S&P 500® Index; U.S. Treasuries, Bloomberg Barclays U.S. Treasury 3-7 Year Bond Index; high-yield bonds, Bloomberg Barclays High Yield Very Liquid Index; international developed market large cap stocks, MSCI EAFE Index; investment-grade corporate bonds, Bloomberg Barclays U.S. Corporate Investment Grade Index; U.S. real estate investment trusts, S&P United States REIT Index. Past performance does not guarantee future results. Indexes are unmanaged and cannot be invested in directly. Fixed income investments also came under pressure during the first quarter as inflation concerns pushed interest rates moderately higher. The yield on the 10-year Treasury rose from 2.46% to 2.74% during the quarter. While Treasuries helped to moderate overall portfolio declines during the correction, they ended the quarter down 0.9%. Still, diversification within bonds benefited investors as emerging markets debt and international bonds were among the top performers. By contrast, interest rate sensitive real-estate investment trusts (REITs) were among the bottom performers, although they rebounded to the top of the charts in March. This quick shift further illustrates the benefits of diversifying across asset classes, which can quickly move from bottom to top performers and vice versa. During the quarter, the Fed raised short-term interest rates a quarter-point and indicated a potentially slightly faster rate of increases in coming years, with 2 additional hikes expected in 2018 and three in 2019. While interest rates are expected to move gradually higher, it’s important to remember why bonds are in your portfolio: to provide income and diversification. For most investors, it’s not a matter of going all-in on bonds or folding completely, but rather including a range of different types of bonds as part of a well-diversified portfolio. 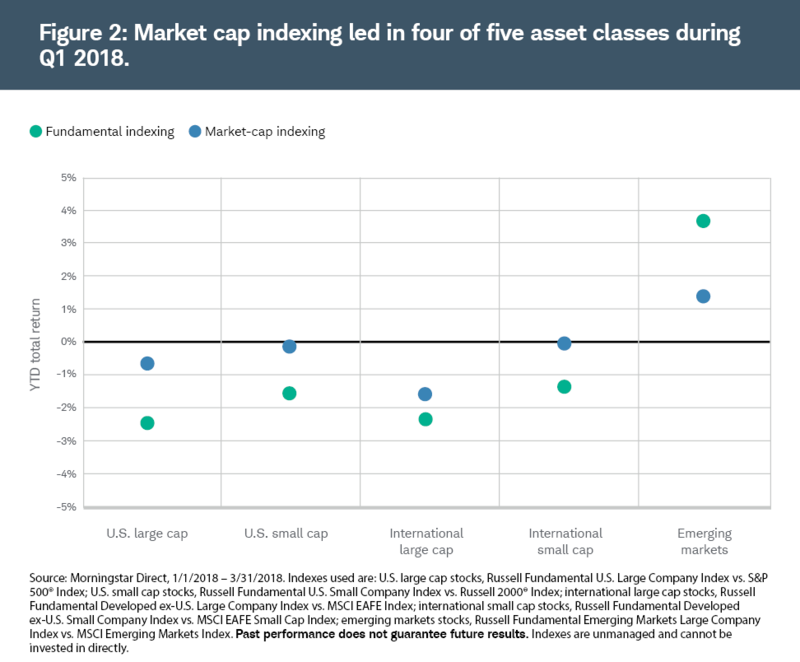 Market cap indexing outperformed fundamental indexing during Q1 in developed markets while fundamental indexing led in emerging markets.2 While the market environment has tended to favor market cap indexing recently, fundamental indexing significantly outperformed market cap indexing in 2016. These shifts in performance leadership illustrate how a combination of both fundamental and market cap indexing in a portfolio can help provide additional diversification. Each of these forms of index investing tends to lead in different market environments, so including both within a portfolio can enhance diversification while retaining the benefits of indexing such as low costs, transparency and tax efficiency. How did Schwab Intelligent Portfolios do? The first quarter of 2018 was a challenging period for the markets, serving as an important reminder for investors that markets are volatile by nature. Market volatility can occur at any time, which is why investing in a broadly diversified portfolio and upholding a disciplined process of rebalancing to maintain your intended level of risk is important. For the quarter, portfolios across the risk spectrum saw negative returns as both stocks and bonds came under pressure. However, broad diversification helped moderate portfolio declines. Knowing which type of portfolio is most appropriate for you, is a matter of understanding your goals and risk tolerance. Schwab Intelligent Portfolios is designed to recommend a portfolio consistent with your objective, time horizon and ability and willingness to take risk. Whether you're invested in a more conservative or more aggressive portfolio is based on your answers to our online investor profile questionnaire. We recommend that you revisit the questionnaire at least annually to ensure that your portfolio continues to be suitable based on your current goal, time horizon and risk tolerance. Moving forward into the second quarter, Schwab's view is that volatility is likely to remain elevated in 2018, but an impending recession doesn't appear to be on the near-term horizon. Though risks to growth have risen amid trade issues and the Federal Reserve continues tightening its policy, the U.S. economy shows few signs of slowing and financial markets continue to be supported by strong corporate earnings and broad global economic growth. While market corrections can be jarring for investors, it's important to remember that they are a normal part of financial markets. Investing in a diversified portfolio consistent with your goals and risk tolerance, and maintaining the discipline to stick with your longer-term financial plan through these periods of turbulence are among the keys to long-term investment success. David Koenig CFA®, FRM®, is Vice President and Chief Investment Strategist for Schwab Wealth Investment Advisory, Inc.
1. This quarterly commentary is designed to provide you with insight into the market environment during the quarter. How your portfolio performed is dependent upon your asset allocation across the risk spectrum from conservative to aggressive, as well as criteria such as when you opened your account, the timing of any deposits/withdrawals, timing of portfolio rebalances, whether you are enrolled in tax-loss harvesting and other criteria.